This is pretty cool – it’s the first time that the Nevada Preservation Foundation has ever featured an event around Boulder City! 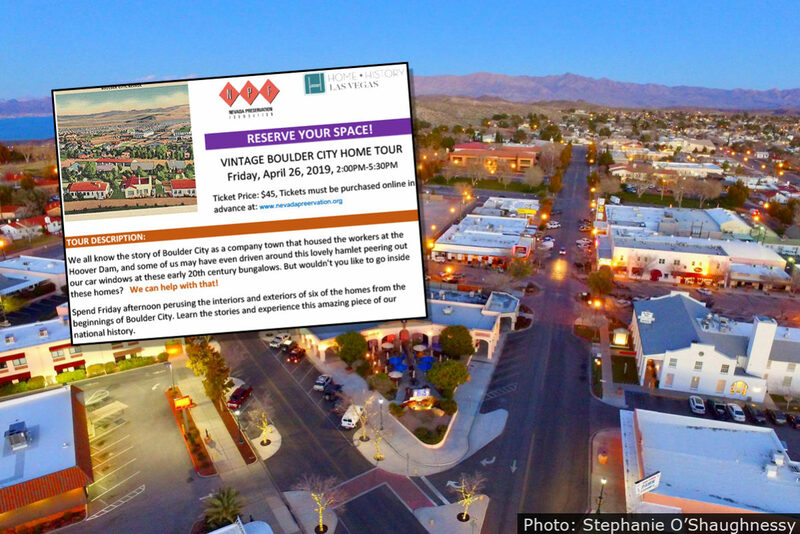 But they have organized a Vintage Home Tour in Boulder City to take place on Friday, April 26th from 2:00pm – 5:30pm. We all know the story of Boulder City as a company town that housed the workers at the Hoover Dam, and some of us may have even driven around this lovely hamlet peering out our car windows at these early 20th century bungalows. But wouldn’t you like to go inside these homes? We can help with that. Spend Friday afternoon perusing the interiors and exteriors of six of the homes from the beginnings of Boulder City. Learn the stories and experience this amazing piece of our national history. Also of note, they are still looking for volunteers to help with check in, and home attendant duties. If you’re interested in volunteering, please contact the Nevada Preservation Foundation directly by email to Rosie@nevadapreservation.org.